In 1912 J M McLuckie obtained a permit for a $41,000 5-storey warehouse that he designed and built. On the permit it was shown shown at 1106 Helmcken, but we’re almost certainly it was really this building; 1106 Mainland Street. It was developed by Kelly, Douglas & Co, and the building here was initially used by the Kelly Confectionary Co, a company created by Robert Kelly. He was the son of an Irish tailor and was born in Ontario. He travelled to Vancouver in 1886, but finding things a bit slow, moved south and managed a general store and telegraph office in McPherson, just south of Los Angeles. Kelly returned to Vancouver in 1887 and established a wholesale fruit and provision business with William McMillan on Water Street. Two years later he became a travelling salesman for Oppenheimer Brothers, leaving the job in 1895 and teaming up with William Braid to form Braid, Kelly and Company, wholesale grocers specializing in tea and coffee. Business was good, but the partnership lasted less than a year as Kelly’s loud style didn’t work with Braid’s more conservative approach to business. Frank Douglas from Lachute, Quebec arrived in Vancouver in 1896. Douglas would be described a few months later by the Vancouver Daily World as “an able and progressive business man.” Despite their differing personalities, the pair created Kelly, Douglas and Company, wholesale grocers and tea importers. The firm prospered, helped by the Liberal political connections that Kelly established. Douglas spent each summer visiting the Klondike to meet clients and secure orders; he was on one of these trips in 1901 when the Islander, the steamer on which he was travelling, hit an iceberg and sank in Lynn Canal, Alaska. Kelly continued running the business, and Douglas’s brother became a partner a few years later. The company’s Nabob brand was registered in 1905 and soon became known for the high-quality pre-packaged teas and coffees that are still sold, (these days as part of Kraft Foods). In 1906 the firm built a huge nine-storey warehouse on Water Street. The Kelly Confection Company Limited was established that year to market confectioneries, and business was good enough for the firm to require its own warehouse, built in the area now known as Yaletown, that the CPR released a couple of years earlier. By 1941, as this VPL image shows, the Mainland Street warehouse was being used by Kelly Douglas for their Nabob branded foods. As in our 1970s image there was a smaller 2-storey building next door; that was replaced in 1989 with a new ‘heritage style’ office building that looks like a former warehouse. Here’s the second Methodist Church built in the city, constructed only three years after the first one was built on Water Street. The dramatic growth in population after the railway arrived saw that building to be entirely inadequate, and this imposing new structure was put up in a recently cleared area not too far from the CPR’s new Granville St hub, but not so far from the population concentrated in the original Old Granville Townsite to the east and north of here. This picture showing the new church at the corner of Homer and Dunsmuir dates from 1890, a year after it was completed. Thomas Hooper was the architect, and this was probably his first major work in the city, although he had arrived in 1886 and been busy as a supervising architect for the Province of BC. What’s remarkable is how short a period elapsed before the building was abandoned as the congregation moved further west to Georgia and Burrard to a new church designed by William Blackmore in 1901. In 1910, this 1889 church was demolished. The congregation had sold the site to the city’s Trades and Labour Council in 1899, who later built the ‘Labour Temple’ on the site, also designed by the now very successful Thomas Hooper. The church negotiated a ‘sale and leaseback’ agreement while they built their new building, and the Labour organization paid $7,000 for the church property here. Initially they had considered re-using the church, but eventually concluded that it wasn’t possible to repurpose it for their needs, and instead redeveloped with the building still there today. It took five years to pay off the mortgage to buy the site; then fundraising started for the replacement. The building on the site today has recently been given a thorough makeover, including some complicated seismic bracing, and is occupied in part by a law office. While we have no idea who designed the 1930s building on the corner of Burrard and West Georgia that housed Oscar’s restaurant and the Palomar Club, we do know who built the building that it replaced, shown here. William Blackmore was hired to design the new Wesley Methodist Church in 1901. The design was very loosely based on H H Richardson’s Trinity Church in Boston – although it’s quite difficult to create a wooden facsimile of a stone building. There’s a 1901 illustration that suggests the Methodists were planning a stone building initially, but no doubt the cost became a factor in the decision to build in wood. The congregation moved here in 1902 from Homer Street, the year this picture of the new church was taken. The old church was located in the eastern side of the city, and some of the city’s wealthier Methodists had moved into the new residential enclave of the West End, and it’s said the church was moved with them. The new church was a bit bigger than the one it replaced – but not a lot bigger. It lasted just 32 years before the congregation moved to another new Wesley church – St Andrew’s Wesley, further south on Burrard Street. We’ve seen the Burrard Building that’s on this corner in an earlier post, both as it is today, and how it was first clad. Here’s what was on the site before the Burrard Building was erected in the late 1950s; a single storey retail building with fins that match those on the passing car. It was 1955 when Walter E. Frost took the picture, not long before the building was replaced, and that’s Oscar’s steakhouse, with an ‘Oscar’ hanging off the corner. Owner Oscar Blanck had died the previous year in a plane crash, but the business, and his name had lived on, although soon after this the restaurant was located across the street at 1023 Burrard, run by his widow. Oscar’s name was sometimes listed at Blank, and at others (more accurately) as Blanck. His death was noted in an Arizona newspaper: “Oscar Blanck, who came here from Winnipeg and built a hamburger stand into one of Vancouver’s largest restaurants , was aboard the ill-fated Trans-Canada Air Lines flight 9, which crashed today over Moose Jaw, Sask. Blanck was proprietor of “Oscar’s,” a gathering place for show people in the heart of the entertainment district“. Ronald Stewart recalled eating at Oscar’s: “In those days, they didn’t serve thick steaks. They were usually about a half to three quarters of an inch thick but the King-size was a porterhouse that filled a dinner plate.” The restaurant bought prize-winning cattle from agricultural fairs each year, and the menu said: “All beef served at Oscar’s is specially grain-fed and hung for 30 days ensuring the very best in quality meats for our guests the year ’round.” Oscar’s nephew was ophthalmologist Herb Fitterman who, in 1968, performed what is believed to have been the first lens implant operation in Canada. The Palomar Supper Club was initially run by Hymie Singer, and later (when Singer joined the war in 1940) Sandy DeSantis, who also led the club’s orchestra. It couldn’t legally sell alcohol, but as one of the classier ‘West End’ clubs it avoided police raids, and there were always ways around inconvenient regulations. In 1949 Billie Holliday performed at the club; in 1951 and 1952 Louis Armstrong and Duke Ellington. The 1937 building, built by Singer where L B Wing’s produce market had been, had a high vaulted ceiling so acrobats and dancers could perform without fear of the low ceilings that were found in some venues. In 1938 the CBC broadcast a half hour swing session from the club every week, putting it on the national map. The Palomar was bankrupt in 1951, but reappeared for a few more years as the New Palomar, still run by Sandy DeSantis. The original High School, built in 1892, and apparently designed by C R Oldershaw, stayed around for many years, although its role changed over time. This Walter E. Frost image was shot in 1954, when it had been the School of Art for nearly 20 years, although the school had officially moved to other premises two years earlier. However, it looks as if this building continued to be used by the Art School – there are easels visible in the windows. While it hadn’t really changed a lot from when it was first built, there was an added fire escape that didn’t do the appearance of the building any favours. Founded originally in 1925 as the Vancouver School of Decorative and Applied Arts, the school was initially situated on the top floor of the Vancouver School Board building at 590 Hamilton Street. Among the Vancouver School of Decorative and Applied Arts’ original teaching staff were the Italian born and trained sculptor Charles Marega, whose lions flank the Lion’s Gate Bridge in Stanley Park in Vancouver, pioneering abstract painter artist Jock Macdonald, and Group of Seven member Frederick Varley. Property magnate Jonathan Rogers was on the Advisory Committee that created the School. The object of the School was “to give a thorough practical knowledge of industrial design, drawing, modeling and decorative painting; and to furnish a sound training to those following, or intending to follow, the various trades, manufactures, or professions requiring such knowledge.” The cost to attend a whole term full time was $25. It was renamed the Vancouver School of Art in 1936 at which time it moved to this building – the former Vancouver (Central) High School. During the early post-War period, artist-instructors such as Gordon Smith and Jack Shadbolt modeled modern abstract painting at the School. The School moved to larger facilities at the renovated former School Board building in 1952, evolved into the Emily Carr School of Art, and now Emily Carr University of Art + Design, moving to Granville Island, and soon to the False Creek Flats. This building had been demolished by 1956, and was replaced with a new structure by the early 1960s. The educational institution that replaced it is the former Vancouver City College; renamed as Vancouver Community College in 1974, when it separated from the Vancouver School Board. Here’s the Vancouver High School on Dunsmuir Street, with the ‘Public School’ (as it’s referred to on the 1901 Insurance Map) in the background, on the same block, further north on West Pender Street. That was also called the Central School, and was designed by Thomas Hooper in 1889 (with Balston Kenway, the supervising architect for the Provincial government). This image dates from 1893, which explains why the new board sidewalks are level, but the streets aren’t – the High School was very newly built. Charles Russell Oldershaw was apparently the architect – although quite how is a bit of a mystery. This cutting from 1892 clearly identifies the name of the architect as Oldershaw, but there’s no one with his name in any of the local street directories (or in Victoria). The only Oldershaw who is an architect is in Chatham, Ontario, and although he moved to Vancouver, that apparently wasn’t until 1898. He didn’t even advertise as an architect in Ontario before 1895, so how he might design an important building like this is unclear. (There is another newspaper reference to him being in the city in 1894, but no other apparent architectural work. There was a 52 year old bricklayer called Alfred Oldershaw in Victoria, but he seems an unlikely designer as well – and his was the only Oldershaw family in the province in 1891. He was originally from Nottinghamshire in England, but had met his wife in Chatham, Ontario so was probably a relative of the architect). The term ‘High School’ is a bit misleading – it doesn’t really refer to a secondary school, but rather a post-secondary institution. Of the forty-two students enrolled during the 1890–91 school year, eight were successful in gaining teaching certificates. ‘The First Fifty Years: Vancouver High Schools’ explains that “In 1894, the passing of an Act which permitted the affiliation of high schools in the province with recognized Canadian Universities, made possible the beginning of the work normally done in a university. In the academic year 1898-99, Vancouver High School made its first systematic attempt to matriculate students; eight candidates were successful. Today it’s still a Vancouver College – Vancouver Community College is located here. Here’s a building that was lost to a fire in 2003. It was most recently known as the Pender Auditorium, but it started life in 1906 as the Myers Hall, and was quickly renamed as the Dominion Hall. The designer and developer were initially hard to pin down, but from the name it looked like it was associated with a short-lived real estate company called Myers and Lamey, who had offices in the building in 1907. However, they didn’t appear in the street directory at all, but they did run a few advertisements in the Daily World, and John M Lamey was in real estate in the city that year. Because Mr. Lamey stayed in the city in the real estate business we know he was young; born in 1884 in Ontario, as was his wife, Florence. He appears to have headed south in 1916, living in Huntington Park, Los Angeles in the 1930 census with Florence and their children; Leo, a nut seller, daughter Margaret, ‘Professional Dancer, Vaudeville’, and two other younger children. The ‘Myers’ looks as if it was ‘Professor’ Myers of the Myers Dance Academy. He started a dancing class ‘in his new hall’ in 1906. The name switch to the Dominion Hall a year or so later may relate to the Dominion Music Company who performed in the hall. Professor Myers was Marion C Myers, and in 1905 he was the Lessee of the Imperial Hall. 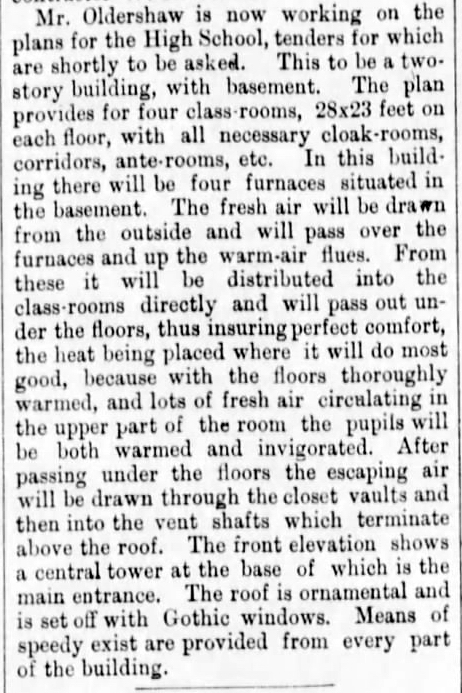 The true developer of the building can be seen in a 1906 Daily World article which mentions that Professor Myers was to be the lessee of Mr. Acland Hood’s new hall on Pender Street. William Acland-Hood’s hall was designed by Dalton & Eveleigh in 1906, costing $35,000 and boasting ‘two upper floors to be devoted to the largest dancing hall in the city’. Professor Myers missed the Canadian census, but it looks as if he was from Indiana, and moved out of Vancouver before 1908. In 1910 he was living in Portland, a real estate broker with his Canadian wife Ada (who worked as a bookkeeper in real estate) and daughters Juanita (8) and Virl, (5). In 1920 (and in 1930) Marion C Myers was living in Thurston, Washington. In 1920 he was aged 53, working as a planerman in a sawmill and living with his Canadian wife Sadie, aged 27, and 15 year old Virl who worked as a waitress. In 1930 Virl had moved out, but Marion and Sadie had four children at home. Marion was working as an auto repair mechanic, and Sadie immigration date to the US was noted as 1918. The basement held the city’s first purpose-built bowling alley, with 12 alleys, four of them reserved for ladies. On the ground floor was another slice of motordom, with the CCM (Canadian Cycle and Motor Co) selling Russell cars (including the top-of-the-range 7 cylinder model) and a range of bicycle brands, including Perfect, Rambler and Blue Flyer. The hall became used by the Canadian Legion in the mid 1930s, and by 1940 it was the Boilermaker’s Hall, then in 1947 the Marine workers took it over and it became known as the Pender Auditorium. Fraser Wilson painted a fabulous mural “a view of a worker’s waterfront”– on the walls, and after the building was sold and plans were made to paint over it, the mural was moved, restored, and rededicated at the opening of the new Maritime Labour Auditorium in 1988. During the 1960s the Auditorium was booked regularly by contemporary music concert promoters, with a wide range of bands playing there, including an early Grateful Dead concert on Friday August 5 1966. The People’s Co-op book store was where the bicycles had once been sold. The organizer of ‘The Afterthought’ concerts wasn’t even 18 when he obtained his business licence and started promoting concerts that year. The hall could legally hold 1,000 (although apparently that was sometimes exceeded) so his entire enterprise was very ambitious, including the first psychedelic light show in the city. As the hall was only available on some weekends, after only a few months Afterthought moved to Kitsilano’s Russian Hall, but other promoters continued to use the venue for live music. The ‘before’ image is said to date from somewhere between 1966 and 1980. The Brill T48 trolley buses were withdrawn from service in the early 1980s, so that’s no help, and the VW is a mid 1960s model, so equally unhelpful. The Pender Auditorium closed in the late 1960s, and this picture shows the ‘Dance’ sign still on the building, and ‘For Lease’ signs in the upper windows where the hall was located, so this is probably late 1969 or early 1970. The building was home to Vancouver’s earliest drag bar, BJ’s, open from 1970 to 1983. There’s a youtube video showing images from the days when it was operating. After a while the Vancouver Club Baths opened in the same basement area of the building. Once the owners of the club, Brian and Jim, sold the club it took on a western theme as Saddle Tramps before converting to a lesbian bar, Ms. T’s.